Preheat the oven to 400 degrees. Place squash cubes on a greased baking sheet and toss with olive oil and ¼ teaspoon salt. Roast for 25-35 minutes, until soft and caramelized on the edges. Transfer squash to a blender. Add remaining ¼ teaspoon salt, stock, maple syrup, nutmeg and cayenne pepper and puree until very smooth (mixture should be watery). Place squash sauce in a saucepan on low heat to keep it warm. In a Dutch oven, cook bacon pieces until crispy. Transfer to a paper towel to drain. Fry sage leaves in the bacon fat until crispy. Place on the paper towel to dry. Add shallot to the bacon fat and stir for 30-60 seconds. Stir in arborio rice, salt and black pepper and bring to medium-high heat. Add a ladle of squash sauce, stirring constantly, until liquid is absorbed, then add another ladle. Continue stirring and adding a ladle of squash sauce and allowing liquid to absorb, until all the sauce is used up and the rice is al dente. Taste and adjust seasoning, if necessary. 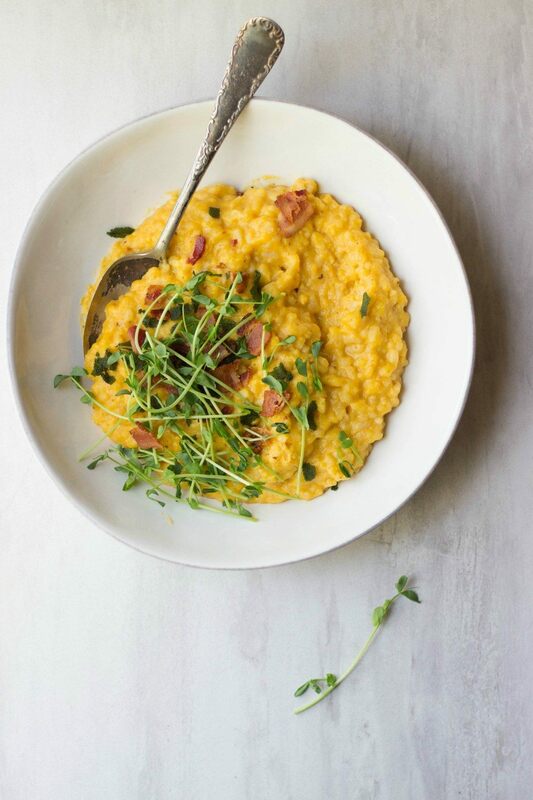 Serve risotto with crispy bacon and sage pieces, Parmesan cheese and microgreens.